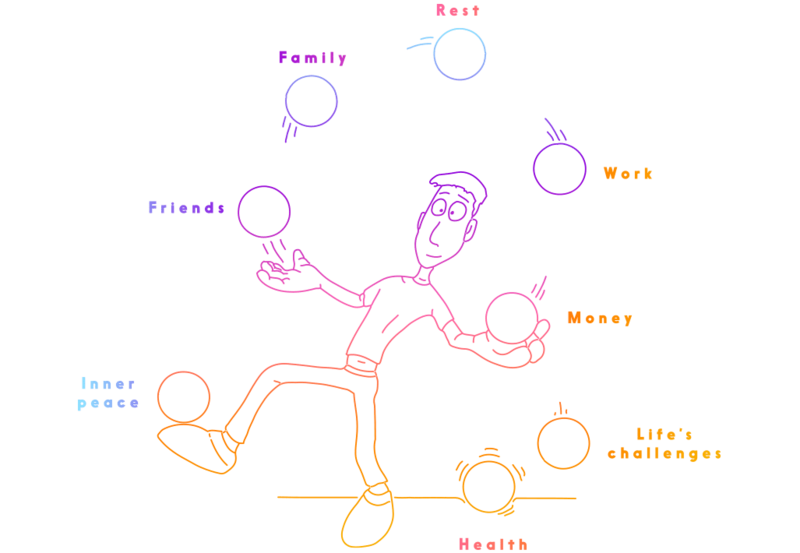 Are you juggling all aspects of your life? Avoid eating 2.5 hours prior to class. Juice or a light soup is ok if you are hungry. Wear layers so you can shed clothes as you and the practice heat up. Bike shorts and a singlet top is a good base. Avoid wearing leggings or shorts with zippers – they destroy yoga mats, props and yourself. Avoid wearing deodorant, perfume, oils, aftershave etc. to class. These products restrict the breath. It might not bother you but it will bother others. You will need to register your attendance at the front desk before every class. If you are late to class do your best not to disturb the class. Remove your shoes etc in the stairwell before entering the studio. On entry, immediately take a seat on the floor near the front door and wait there until you are shown to a mat. Make sure you come by the desk after class to register your attendance. Mats and props are provided for you. Remember to turn your phone off before class. Muscle soreness is a natural part of the body’s rejuvenation and transformation process. Regular practice and a warm bath will alleviate most issues here. If you have any questions or concerns regarding the practice do not hesitate to give us a call or chat to us after class.